Meanwhile, born on a farm, my dad had a closer relationship to nature than most folks do today. That’s just the reality of living in a time where there were fewer insulators between humans and nature. So it’s not surprising the things he knew about nature. So one summer, outside our house in Omaha, the men in a big truck came to chop down a tree. My dad said it was a shame to cut down a healthy tree just for the sake of a parking lot. “That one tree,” he said, “does the cooling of 20 air conditioners.” I was baffled. He went on to tell me how it wasn’t just about the shade. It had something to do about the exchange of air, called “transpiration.” Well, I knew he must be telling the truth because I remembered, even at that young age, how cool the forests were in Montana when we visited and how warm it would be in a pasture right next to it. You could feel the coolness coming right out of the trees. Today. Turns out, dad was right, as usual. Even dumb scientists agree. After measuring, they find that indeed, there is a lot of cooling that happens with trees. Scientists have started calling the urban intrusion into greenspaces the “urban heat island effect.” Asphalt, hardscape, structures — basically anything that man builds — contributes to global warming to a significant degree. Global predicaments aside, there is impact on the local scale. It’s all around us and one of the notable beachheads we as sensible people can establish is protecting what few greenspaces we have in our neighborhoods. Every tree, every green, porous, natural surface is a gift from Nature that provides more benefits than some folks have trouble understanding. We as a species believe that we know better than Nature, that altering nature is within our scope of skills. It isn’t. Learning to live with nature rather than forcing nature to live with our ideas is the greatest challenge we face. Fortunately, some of the wiser people throughout history knew that keeping swatches of undeveloped green between the reflective, hard surfaces that humans seem to prefer was a smart idea. Such wise persons lived in our city of Omaha over 100 years ago. Some of them commissioned Horace Cleveland, a world-renowned landscaping expert and designer, to layout the course of natural greenspace that makes up Omaha’s historic boulevard system. The system is registered as a national historic treasure and as the designers intended, provides the very kind of green respite from urban intrusion that helps keep the city cool and healthy. Dundee Sunks One of the 16 boulevards in the system is Happy Hollow Boulevard. A major part of that boulevard runs north and south between Hamilton Street and Underwood Avenue, near the north side of Memorial Park only two blocks away. In the section between Underwood and Western Avenues, the boulevard embraces a former creek bed that is now vibrant, green, rich soil crowned by dozens of mature, leafy trees. 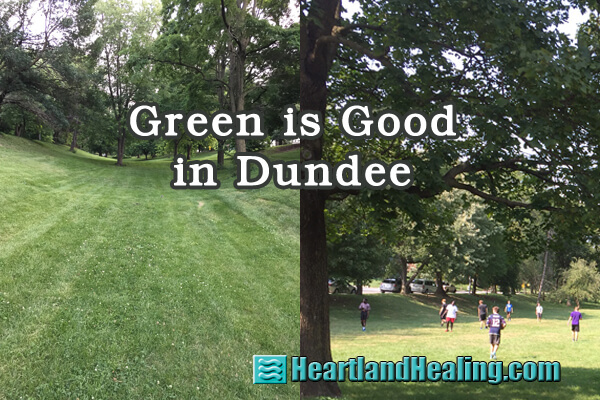 Locals call it “the Sunks.” It is one of the best examples of cooling, restful greenspace that exist in the boulevard system. Important: Having driven the entire 32 miles of the system last October to verify, not ONE of the 16 boulevards in Omaha has any permanent structures or hardscape to interfere with its intended purpose. With the summer heat upon us, there is no better example of trees cooling our lives than the Sunks. Here is my invitation to you: On a sunny, hot day in the very near future, park your car, walk across the open, grassy field at the south end of the Sunks. Enjoy the warm, sultry glow. Then walk into the middle section with its canopy of blissful protection, its comforting cocoon of quiet. You’ll feel what magic trees can do. Save the Sunks. A group of developers with some financial support and some political clout want to cut down the trees in the middle of the Sunks, remove the living topsoil, cover it with hardscape, permanent structures, walls and staircases; all in some kind of perverted notion that they can do better than Nature, better than our forefathers. Removing nature for the sake of a misguided project will most certainly raise the temperature of the neighborhood. It already has. To learn more visit SaveTheSunks.org.